"Rich and creamy creme Anglaise is perfect drizzled over fresh fruit, pound cake, or other desserts." Whisk egg yolks, cream, sugar, brandy-based orange liqueur, and vanilla extract in a small saucepan until smooth. Place saucepan over medium-low heat and cook, stirring constantly with a rubber spatula scraping the bottom, until the mixture is hot and thickens slightly, and a thermometer reaches 180 degrees F (82 degrees C), 8 to 10 minutes. Remove from heat, strain to remove any over-cooked particles of egg, and allow cool. See how to make a classic, creamy sauce with tangy blue cheese. 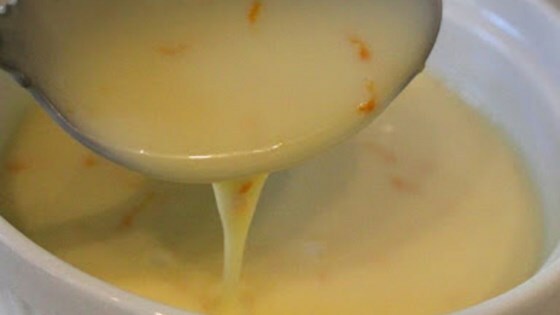 For added orange flavor, add some freshly grated orange zest to the cooled creme Anglaise. This is an excellent sauce. If you add the zest and extra brandy make sure to let the sauce rest overnight to develop the flavour. I used 1/2 tsp vanilla & didn't use liqueur. Awesome but need to double next time. I added the orange zest and used this sauce over Egg Nog Bread Pudding for a Christmas Brunch. Absolutely delicious. One of my favorite ways to use this = drizzle over carrot cake. YUM. This is so versatile though, and works for just about anything. Except ribs. Gross.